Recent catastrophic wildfires, unhealthy forests, and extreme conditions such as drought have increased concerns about wildfire risks to people, natural resources, critical infrastructure, and even national security. Los Alamos National Laboratory is leveraging its strengths in modeling, simulations, and high performance computing to address critical questions ranging from why fires behave the way they do to how can we manage fire risk and return fire to its natural role in the environment. The work supports efforts by Los Alamos’ partners in the USDA Forest Service, Tall Timbers Research Station, Department of Defense Wildland Fire Centers, and Canadian Forest Service. Nature has various examples of yin and yang, including fire and water, both of which can be destructive and beneficial. Like yin and yang, how fire and water interact — and which one reigns supreme, even for a short time — influences the destinies of plants, animals and people. Chinese philosophy tells of yin and yang, two timeless forces that oppose yet complement each other to maintain the universe’s harmony, influencing everything within it. Nature has various examples of the concept, including fire and water, both of which can be destructive and beneficial. Like yin and yang, how fire and water interact — and which one reigns supreme, even for a short time — influences the destinies of plants, animals and people. Fire at first might seem exclusively destructive. According to the National Interagency Fire Center, in 2018 more than 50,000 wildfires scorched more than 8.5 million acres across the United States. Verisk’s 2017 Wildfire Risk Analysis reported losses from wildfires exceeded $5 billion during the past 10 years. But wildfires aren’t always a bad thing for the environment. Indeed, using fire to manage land goes back thousands of years, with Native American peoples using fire to alter the structure and composition of forest and grassland ecosystems. Fire-management processes continue today, including prescribed burns. These intentionally set fires eliminate excessive vegetation, but don’t burn too hot. Water and other nutrients remain in the soil. Not only do prescribed burns reduce the risk of wildfires, they also can influence the growth of desirable plants. Yet there’s still a lot scientists don’t know about the yin-yang interaction between fire and water. Of particular interest is better understanding how the heat intensity of wildfires changes the the water content of burned soil. The science behind such work is known as hydrology, which studies the properties, distribution and circulation of water on or below the earth’s surface. Wildfires affect soil moisture either by cutting off a process known as evapotranspiration, when water vapor escapes through tiny pores in plant leaves, or by increasing surface runoff — or both. When a wildfire destroys plant life, that evaporation route known as transpiration is removed. The moisture can’t easily transpire through the vegetation from the soil, so the soil stays wet. But also, after a fire, more water runs off the surface. Particularly hot wildfires not only destroy living vegetation, but they also change soil properties and consume the water-absorbing layer of leaves, needles, twigs and pieces of bark — called litter and duff — that have fallen to the forest floor. Without litter and duff, the soil absorbs less water. When the rain comes, the resulting surface runoff tears through the soil, and that erosion can cause natural disasters like mudslides (common in places such as California) and the locally familiar flash floods that scour through canyons and arroyos. The initial experiment using the Los Alamos model indicated that that soil moisture generally increases following fire with the exception of high-severity-burn areas that experience greater surface runoff — the soil is much drier after a really intense wildfire. If heavy or frequent rainstorms follow a fire, the chance of flooding increases, but the soil winds up drier than it was before the fire, despite all that flowing water. This experiment also verified the competition between evapotranspiration, which makes soil wetter, and surface runoff, which makes soil drier. Future work using this model and others will help explain and more specifically measure how these two competing processes change the water content in soil based on the severity of the wildfire’s heat. Wildfires will continue to be unpredictable, but advanced modeling software may one day predict water content in soil across a range of burn severities. That will give decision makers in government and industry better information to understand the risks to water resources. It will also enable planners to develop more effective processes to reduce the risk of wildfires and influence the growth of more-desirable ecosystems. And it will help scientists deepen their understanding of the timeless link between fire and water and how they influence the ecosystems they affect every day. Adam Atchley is an ecohydrologist in the Computational Earth Science group Los Alamos National Laboratory. He studies multiple process that are tied together by the flow of water into, over and through the Earth’s surface. Wildland fires play an important role in ecosystems, yet they’ve been discouraged from landscapes for a century. The result is more intense, destructive fires. Simulating fires help us predict how they’ll behave when they do happen. Wildland fires play an important role in many ecosystems, yet in the western United States land managers have spent a century excluding it from the landscape. The resulting overgrown forests, along with hot and dry conditions, have changed the nature of fires when they do happen, making them more intense and more destructive. Figuring how best to respond is important for the health of our forests, the safety of nearby communities, and the well-being of firefighters on the job—and it’s a task that can now draw on some of the most powerful computers in the world. With the US Forest Service, the Lab is using a tool called FIRETEC to simulate the fire/atmosphere interaction that controls fire behavior, from low-intensity fires under marginal conditions to catastrophic wildfires—two extremes where our ability to predict fire behavior is least developed. This includes addressing key questions about both prescribed fire tactics and the fundamentals of fire behavior responses to terrain, fuels, and wind conditions. This story first appeared in Albuquerque Journal. In 2011, a New Mexico wildfire went from normal to nuclear, torching more than 150,000 acres of land and spewing a massive plume that contained smoke, debris, and burning hydrocarbons. Three local scientists set out to learn why. In 2011, a New Mexico wildfire went from normal to nuclear. Three local scientists set out to learn why. ON JUNE 27, 2011, A WORRIED HOMEOWNER NAMED MARK Winkel stood on his porch and pointed his telescope at a wildfire ripping through the forest several miles from his home outside Los Alamos, New Mexico. 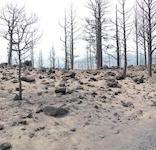 The blaze had started 12 hours earlier when a strong gust knocked an aspen into a power line in Las Conchas, a hiking trail along a 13-mile-wide caldera called the Valles Grande. 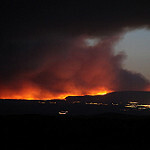 Already it had torched about 7,000 acres, an impressive rate of spread, but predictable given the heavy winds and the onset of fire season, which would last until July’s monsoons finally saturated the tinderbox. Having faced three big wildfires in the span of 20 years, locals in this part of parched and drought-stricken New Mexico knew enough to consider this one dangerous. But it was now 1:30 a.m., an hour when most fires, faced with cool air, calm for the night. As Winkel pointed his scope up one of the eight canyons that radiate like spokes from the caldera, he saw something unexpected: a yellow-orange wall marching down the southern face of the Jemez Mountains that surround the Valles Grande caldera. Wildfires don’t typically burn downhill. They climb upward, their flames drying and igniting the fresh vegetation above. This one was racing downslope, at night, directly at Winkel. Worried, he scrambled uphill for a better view. Near the top, a hot wind struck his chest, and he watched to the northwest as the blaze’s front rolled like barrels in 35-foot-high flames. He had never seen this effect before—few people have. Winkel was witnessing a blowup, an intense and sudden force, second in power to a nuclear explosion, able to boil stream water, melt dirt, and crack boulders. This one would spawn a horrific 45,000-foot furnace of smoke and soot, spin up 400-foot-high fire tornadoes, generate powerful updrafting and downdrafting winds, create lightning high in the plume, and send embers flying almost 25 miles away. 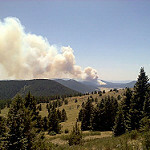 Fire-behavior experts had predicted Las Conchas would expand to 12,000 acres overnight. Instead, by the time the sun rose, it had rendered 43,000 acres to white ash. Now the conflagration was advancing on the towns of White Rock and Los Alamos. Afraid it would burn homes, authorities ordered roughly 18,000 residents to flee. Some experts went on TV to express concern that the approaching flames might reach the Los Alamos National Laboratory, which houses tons of nuclear waste. Firefighters from state, local, and federal agencies descended on the area to stop or at least slow the blaze. It took weeks for them to halt its progress. Today, the eastern caldera remains a scorched moonscape. Six miles from the Los Alamos lab, as Highway 4 climbs steeply into the caldera, the ancient ponderosa forest suddenly gives way to a sprawling expanse of dead trees, a landscape so barren that it takes luck to find a stick thinner than 4 inches. Even pines just beyond the inferno’s reach were baked to death, their needles kiln-dry. In the end, Las Conchas proved one of the most violent blowups in recent history. But what triggered it? EXTREME WEATHER DRIVES EXTREME FIRE. A strong and relentless wind in a dry area can stoke even smoldering trash into a runaway ­inferno. The Las Conchas Fire ignited in a dense forest during the worst drought in millennia, with winds blowing up to 40 miles per hour, 20 feet off the ground, driving the flames forward. Extreme wildfires, in turn, create their own weather. As intense heat lofts smoke into the air, it forges a convective column that generates powerful updrafts. It carries fuel-rich hydrocarbons, a ­byproduct of burning vegetation, that can ignite like gasoline ­vapor. The heat also propels moisture that condenses into ­pyrocumulus clouds. These anvil-shaped thunderheads perch atop smoke columns and spawn extreme turbulence, downdrafting winds, and even hail that, rather than cooling flames, stokes them by churning out even more erratic winds. It sometimes seems like wildfires are getting more frequent. They’re not. But they are getting more intense, giving rise to an age where megafires raze towns, claim lives, and bring camera crews running. ­California’s 2013 Rim Fire burned 402 square miles. Arizona’s 2013 ­Yarnell Hill Fire destroyed a town and killed 19 elite firefighters by trapping them in a canyon. These conflagrations are outliers, monsters that color America’s fear of flames. But they all started the same way, as tiny, ­insignificant blazes that, for reasons science has yet to describe, transitioned in a few ­devastating moments into savage blowups. About four months after the Las ­Conchas blaze, Linn and some scientists visiting from around the Southwest toured the site. What they saw had all the tells of an exceedingly rare phenomenon known as a column collapse; experts have long believed this event occurs when a tower of smoke and soot gets so heavy, it falls back to earth, creating a wind so powerful that it blows on the surrounding fire like a bellows. Linn was intrigued. Whatever the exact cause of the blowup, he now had an excuse to study, in his own backyard, one of the rarest events in wildfire science. And he had access to what almost no other scientist did: supercomputing power, courtesy of Los Alamos National Laboratory. He quickly assembled a team of specialists and landed a lab-sponsored, three-year research grant. It was the same type of grant that had launched Linn’s research more than two decades earlier. Back then, his task was crisis forecasting. He used supercomputers to try to predict when and where the next great inferno would burn. Now he would explore the forces that generate them. ONE FRIDAY IN APRIL, I MEET LINN'S TWO TOP RESEARCHERS on the Las Conchas project: ­Jesse Canfield, a slow-talking Chicago-born fluid dynamicist who wears threadbare ­Carhartts and hiking boots, and Jeremy Sauer, a fast-talking geophysicist and Montana native. We gather around a conference table in the library. Across the street, past a bank of lockers where lab employees stow their cellphones to prevent hacking, a fire-station ­radio pops with nonemergency traffic. Sauer stands at a whiteboard, doodling a picture of the Jemez Mountains with flames racing down from its peaks. As the fire burns, he explains, it releases energy that pushes soot, smoke, and hydrocarbon gases into the atmosphere. Take away its fuel—like if it encounters water or rocks—and its energy suddenly disappears. All that stuff that rose, now heavier than the air around it, can now fall back on itself, creating a forceful wind that explodes the inferno. The technical term for such a wind is a density current, heavy air plowing into lighter air. “In this case, it was a layer of dense air that generated a wind as it flowed downhill,” Sauer says. Canfield had pored through the wildfire science literature, turning up other blowups, including one in 1871 that burned a million acres in a few days. Density currents most likely caused it. But experts had blamed only one fire on a possible column collapse. That was the 1990 Dude Fire in Payson, Arizona, that killed six firefighters. Like Las Conchas, it had raced downslope. To test the hypothesis that a collapse had stoked the Las ­Conchas Fire, the researchers headed to the supercomputers. For six months, Canfield coded a simulation of the blaze, mapping the terrain and the smoke column. They wanted to know, theoretically, the highest wind that a collapsing column would produce. In his simulation, you can see an ink-purple cloud rising above Las Conchas topography, but with no fire beneath it, the cloud falls. When the column strikes land, it’s like a detonated building billowing dust, the force of the density wind rushing out in every direction, generating surface winds of up to 131 feet per second, plenty strong to trigger a blowup. “It was proof of concept,” Canfield says. Trouble was, the results were misleading. And Canfield knew it. He pulls out a notebook filled with math symbols. “Nerd ­hieroglyphics,” he calls them. The calculations show that at peak intensity, Las Conchas sent an estimated 2.3 tons of soot into the atmosphere every second. “That’s equivalent to the weight of about 9,000 Honda Accords launched into the sky in two and a half hours,” Sauer says, marveling at the enormity of the fire’s power. But those Hondas actually disprove the hypothesis. In order for all that weight to fall at once, the plume would have to lose heat faster than it shed weight. Physics dictates that ­process is a near impossibility. So for this column to collapse so ­suddenly, the fire would have to have flicked off like a light switch. But Las ­Conchas did not go out like that. Not before and not after the ­blowup. In fact, it burned on for five more weeks. So the team’s primary—and most compelling—suspect turned out to be a boogeyman. After a year of work, it would’ve been understandable if Linn’s team was disappointed. They weren’t. “That’s science,” Canfield says with a shrug. “You generate a hypothesis, then you set out to disprove it.” With one of firefighting’s most persistent myths dispatched, they moved on. BY NOW THE TEAM HAD IDENTIFIED A FEW of Las Conchas’ main characteristics. Among them, something Sauer had spotted from the front stoop of his house: a pair of counterrotating vortexes that churned inward along the entire axis of the 45,000-foot-tall plume of smoke and ash and fire. “I was blown away; seeing that column was to witness all my theoretical science in real life,” Sauer says. It’s Saturday morning, and I’ve joined him on that stoop as he looks west from the small ranch house toward the burned trees lining the Valles Grande, the caldera about 12 miles away where the plume once towered. The vortexes he saw had created a vacuum that very likely sucked up flames and generated 400-foot-high ­tornadoes of fire. The same “massive vertical velocity,” as Sauer put it, had ripped pine cones from branches, ignited them, and shot them into the air, where winds carried them as far as 2 miles away, igniting smaller blazes ahead of the main fire. Lighter debris, like pine needles, rose to the column’s full height and rained out miles farther. One witness reported ash falling 25 miles to the west. Early in their research, the team considered a number of ­suspects but set them aside to pursue the column-collapse hypothesis. Now they returned to the Weather Research and Forecasting Model. This uses an atmospheric data set at mesoscale—weather systems ranging from 3 to 60 miles, or roughly the size of sea breezes and ocean squalls—and helps meteorologists create daily forecasts. Using the lab’s supercomputers, Sauer and the team plugged in the wind and local-temperature measurements from nearby weather towers for June 26 and 27, along with topography, such as mountains and canyons, and scaled the forecast to the fire’s size. What the computer spit out resembled a topographical map, but for the atmosphere, with pressure, wind speed, and direction plotted at several elevations. For the night of June 26, Sauer noticed a curious pattern. Between 400 and 600 feet above the fire, in a boundary between two atmospheric layers, a sine wave representing oscillating pressure began at the crest of the Jemez and rolled and broke in the exact direction in which Las Conchas had blown up: a signal for a strong wind blowing downcanyon. As he looked at the chart, Sauer recognized that the pass between the Valles Grande and Frijolos Canyon was a textbook example of the topography that can shape mountain waves. These winds form on the leeward side of a peak when low and dense air squeezes between the peak and another air mass above it. As pressure builds, air speeds up—like water in a crimped hose—and becomes a heavy wind. Highly turbulent air above mountains has been known to cause airplane crashes. But almost no research has been done on the surface-level currents that mountain waves create. Could one have created the density current that blew up Las Conchas? Sauer thought it possible. So he dug in. He spent a year developing a simulation of air moving from the caldera down the canyons. He pulls up the resulting animation. It looks like a rainbow bred with a lava lamp. “Check out right here,” he says, pointing to a river of digitized air squeezing through a mountain pass. Where his finger rests, a wind current shoots down the Jemez mountain slopes. Near the fire, the air roils like froth at the end of a breaking ocean wave. It was just as Mark Winkel, the only known eyewitness to the blowup, had reported seeing that night: air rolling like burning barrels. One afternoon I join Canfield, Sauer, and Linn at Los Alamos’ only decent bar, Bathtub Row, a microbrewery busy with scientists who have accepted life beside the moonscape left by the Las Conchas Fire. Beer helps. After determining that the blowup wasn’t caused by column collapse, counterrotating vortexes, or a mountain wave, the team returned yet again to step one, and this time looked inward. They investigated an effect that they’d observed on evenings just like this, talking fire and drinking beer on their back porches. One night, Keeley Costigan, an atmospheric chemist in the lab, overheard them venting their frustration. She had been studying the ­molecular makeup of smoke particles in the Las Conchas Fire. It turned out that she’d been pulling data from a 150-foot research tower that stands in an unburned canyon just north of the blowup. The team had not ­included it in their mesoscale modeling. Intrigued, they pulled the tower’s data. Once again, a compelling pattern emerged. On three of the five nights prior to June 26, precisely between 10 p.m. and 3 a.m., a downcanyon breeze had blown at a rate they recognized with amazement: roughly 26 feet per second. “The fingerprint matched,” Sauer says. In the nine hours preceding the blowup, 40-mile-per-hour gales had stretched the Las Conchas Fire into a thin and narrow footprint about 6 miles long by 1 mile wide. After the sun dipped behind the caldera’s 11,000-foot Redondo Peak, the temperature cooled, the winds dropped, and the fire—as expected—began to calm. But then, as the nighttime air cooled and became denser, it began to pool inside the caldera like water filling a 13-mile bathtub. At around 10 p.m., this pool of dense, oxygen-rich air spilled over, generating 26-foot-per-second winds that sloshed down the canyons. They struck the flames perpendicular to the fire’s path. And just like that, what had been a 6-mile-long simmering southern flank woke in a dragon’s breath. So firefighters—and the meteorologists who sometimes work alongside them—can deploy more-sophisticated models to predict whether a wildfire will go nuclear, endangering lives and property. Linn drinks from his beer. Behind him, the setting sun casts numberless torched trees in silhouette. If Las Conchas has a ­silver lining, it’s a grim one. The risk of another blowup striking Los ­Alamos is thin. There’s nothing left to burn. Kyle Dickman, a former wilderness firefighter, is the author of On the Burning Edge, a book about the 2013 Yarnell Hill Fire that killed 19 elite firefighters. This article was originally published in the July/August 2017 Extreme Weather issue of Popular Science. We can’t stop all fires—and we shouldn’t. Healthy ecosystems depend on them. But understanding what drives big fires and predicting their behavior helps the fire community prepare for the next blaze through appropriate emergency plans and firefighting strategies. This summer, throughout the West, higher temperatures and decreased precipitation brought on by climate change have ramped up the frequency of wildfires — big, catastrophic fires — while a century of fire suppression feeds the flames with a thick tangle of fuel in our overgrown forests. We can’t stop all fires — and we shouldn’t. Healthy ecosystems depend on them. But understanding what drives big fires and predicting their behavior helps the fire community prepare for the next blaze through appropriate land management, emergency plans and firefighting strategies. Beyond those benefits, a deeper understanding of wildfires prompts important insights into tactics for using prescribed fire as well as insight into larger regional environmental issues, including how fires change river flows and the availability of water for drinking, agriculture and energy production. For scientists studying wildfire, the challenge is predicting the seemingly unpredictable. A wide range of conditions — temperature, humidity, wind speed, wind direction, larger weather patterns, available fuel, fuel conditions and terrain —influence the behavior of fire. Figuring out details such as the movement of hot gasses coming off a raging forest fire or the combination of convective and radiative heat transfer that ignite unburned fuels, for example, seems impossible at first. There’s so much to consider, from how the fire front interacts with the atmosphere that drives it forward to the feedbacks of the fuel’s structure on the fire and winds to the impacts of the topography and regional meteorology. Fortunately, Los Alamos National Laboratory is well suited to address this kind of multidisciplinary, ultimately physics-based problem — and the lab has a stake in wildfire prediction and management. As the Cerro Grande and Las Conchas fires demonstrated, the laboratory and neighboring communities are equally vulnerable to runaway conflagrations on our doorstep. Furthermore, Los Alamos’ mission includes addressing energy security and national security, both of which can be affected by wildfires. Modeling wildfires exploits the lab’s unique capabilities in physics, computational modeling and high-performance computing. For decades the lab has built computer models of complex systems that move and change through time. That work includes hot gasses — fire — and the atmosphere. The laboratory’s supercomputers make it possible. 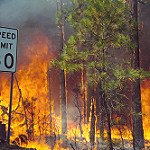 When a team of atmospheric scientists, computational physicists and mathematicians in the laboratory’s Earth and Environmental Sciences division, collaborating with the U.S. Forest Service Rocky Mountain Research Station and Southern Research Station, set out to simulate the interacting processes that make up a wildfire as a basis for predicting its behavior, they leveraged a wealth of expertise and experience that had been developed partially through the laboratory’s weapons program. But there’s more research to be done to further improve wildfire modeling for practical use in the field during a fire. FIRETEC’s complexity and the massive amounts of data involved require enormous high-performance computers such as those available at Los Alamos to perform simulations. The laboratory-led team is now working with the Forest Service to apply what it learns from FIRETEC to assist in developing and refining less detailed but faster-running tools that incident fire commanders could run on their laptops to predict fire behavior over the next few hours. This is a short enough time frame to deploy firefighters in anticipation of the fire’s next move or help keep firefighters out of harm’s way. This faster-running tool could also benefit decision-support tools such as Simtable, which is currently used in the laboratory’s Emergency Operations Center. On another front, as part of a larger Los Alamos study on the impact of climate-driven changes on watersheds, laboratory researchers are working toward using FIRETEC to potentially spin off simplified models. One model can explore, for example, how the aftermath of a catastrophic fire in the Colorado River system might alter flows in the San Juan River. That’s important locally because the San Juan supplies drinking water to Santa Fe and cools the Four Corners Generating Station, a major regional energy source. How will climate-driven changes to vegetation alter the pattern of fires and the severity of the effects in that watershed? What can be done to minimize those impacts? Research underway now should answer these questions. Providing those answers is an appropriate endeavor for Los Alamos for several reasons. While the Los Alamos community has had more than its fair share of encounters with wildfire, the research is more than personal: it fits the laboratory’s mission to enhance energy security and national security. Additionally, the required expertise in the combination of multi-phase fluid dynamics, heat transfer, combustion, computational modeling and computer science are optimally aligned with many of the laboratory’s other mission areas. “Science serving society” is a catchy phrase, but in the case of wildfire modeling at Los Alamos, it couldn’t be more apt. This story first appeared in HuffPost Science. Throughout the West, higher temperatures and decreased precipitation brought on by climate change have ramped up the frequency of wildfires. The 3D model FIRETEC presents a new way of studying fire and learning how to better manage it. This summer, New Mexicans are once again holding their collective breath and keeping an eye out for telltale columns of smoke. Here and throughout the West, higher temperatures and decreased precipitation brought on by climate change have ramped up the frequency of wildfires — big, catastrophic fires — while a century of fire suppression feeds the flames with a thick tangle of fuel in our overgrown forests. For scientists studying wildfire, the challenge is predicting the seemingly unpredictable. A wide range of conditions — temperature, humidity, wind speed, wind direction, larger weather patterns, available fuel, fuel conditions and terrain —influence the behavior of fire. Figuring out details such as the movement of hot gases coming off a raging forest fire or the combination of convective and radiative heat transfer that ignite unburned fuels, for example, seems impossible at first. There’s so much to consider, from how the fire front interacts with the atmosphere that drives it forward to the feedbacks of the fuel’s structure on the fire and winds to the impacts of the topography and regional meteorology. Modeling wildfires exploits the lab’s unique capabilities in physics, computational modeling and high-performance computing. For decades the lab has built computer models of complex systems that move and change through time. That work includes hot gases — fire — and the atmosphere. The laboratory’s supercomputers make it possible. Providing those answers is an appropriate endeavor for Los Alamos for several reasons. While the Los Alamos community has had more than its fair share of encounters with wildfire, the research is more than personal: it fits the laboratory’s mission to enhance energy security and national security. Additionally, the required expertise in the combination of multi-phase fluid dynamics, heat transfer, combustion, computational modeling and computer science are optimally aligned with many of the laboratory’s other mission areas. “Science serving society” is a catchy phrase, but in the case of wildfire modeling at Los Alamos, it couldn’t be more apt — or local. This story first appeared in The Santa Fe New Mexican. Current fire spread models are inadequate for predicting the complex influences of atmosphere, forest structure, and self-generating fire processes on wildland fire behavior. FIRETEC is a physics-based, three-dimensional computer code developed at Los Alamos National Laboratory (LANL) to capture the constantly changing, interactive relationship between wildland fire and its environment. 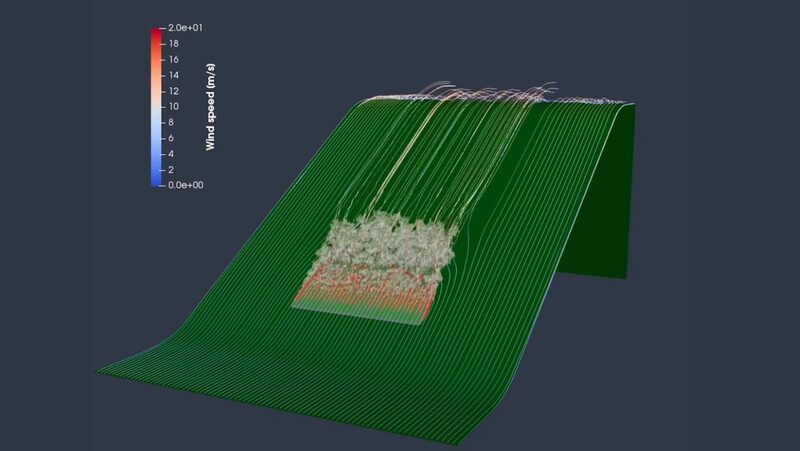 To accurately represent interactive fire processes, FIRETEC combines physics models that represent combustion, heat transfer, aerodynamic drag, and turbulence with a computational fluid-dynamics model, HIGRAD, which represents airflow and its adjustments to terrain, vegetation, and the fire itself. As scientists and managers seek to understand fire behavior in conditions that extend beyond the limits of our current empirical models and prior experiences, they will need new tools that foster a more mechanistic understanding of the processes driving fire dynamics and effects. Here we suggest that process-based models are powerful research tools that are useful for investigating a large number of emerging questions in wildland fire sciences. These models can play a particularly important role in advancing our understanding, in part, because they allow their users to evaluate the potential mechanisms and interactions driving fire dynamics and effects from a unique perspective not often available through experimentation alone. For example, process-based models can be used to conduct experiments that would be impossible, too risky, or costly to do in the physical world. They can also contribute to the discovery process by inspiring new experiments, informing measurement strategies, and assisting in the interpretation of physical observations. Ultimately, a synergistic approach where simulations are continuously compared to experimental data, and where experiments are guided by the simulations will profoundly impact the quality and rate of progress towards solving emerging problems in wildland fire sciences. Landscape heterogeneity shapes species distributions, interactions, and fluctuations. Historically, in dry forest ecosystems, low canopy cover and heterogeneous fuel patterns often moderated disturbances like fire. Over the last century, however, increases in canopy cover and more homogeneous patterns have contributed to altered fire regimes with higher fire severity. Fire management strategies emphasize increasing within-stand heterogeneity with aggregated fuel patterns to alter potential fire behavior. Yet, little is known about how such patterns may affect fire behavior, or how sensitive fire behavior changes from fuel patterns are to winds and canopy cover. Here, we used a physics-based fire behavior model, FIRETEC, to explore the impacts of spatially aggregated fuel patterns on the mean and variability of stand-level fire behavior, and to test sensitivity of these effects to wind and canopy cover. Qualitative and quantitative approaches suggest that spatial fuel patterns can significantly affect fire behavior. 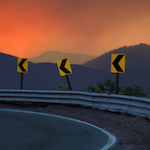 Based on our results we propose three hypotheses: (1) aggregated spatial fuel patterns primarily affect fire behavior by increasing variability; (2) this variability should increase with spatial scale of aggregation; and (3) fire behavior sensitivity to spatial pattern effects should be more pronounced under moderate wind and fuel conditions. Overgrown forests and dry conditions have made wildland fires more destructive. Simulations help us prepare for future fires. A 3D model presents a new way for scientists to study the behavior of fire in order to learn how to manage it. 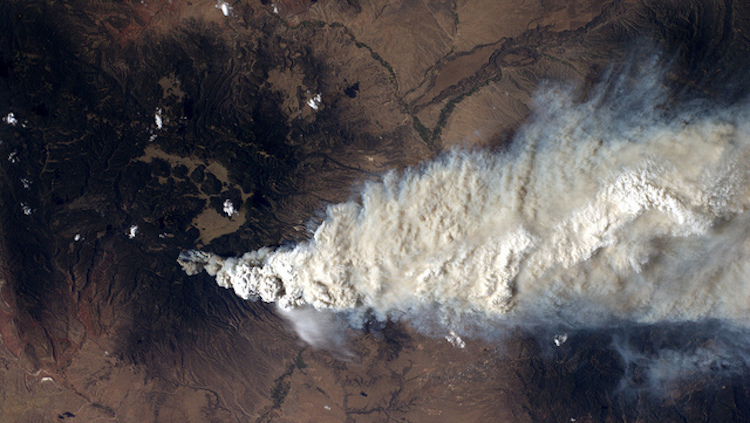 The International Space Station took this photo of the Las Conchas Fire, burning southwest of Los Alamos National Laboratory, in 2011. 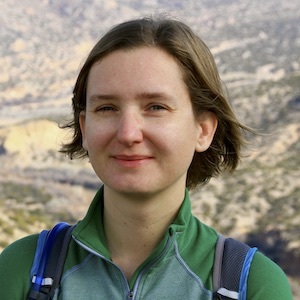 Linn is project leader for wildfire research at Los Alamos National Laboratory in the Environmental Sciences Division. 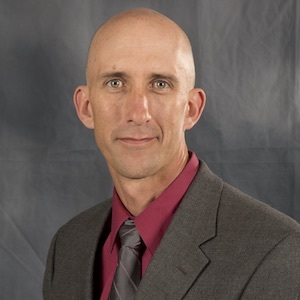 He is the principal investigator/developer for FIRETEC, a physics-based wildfire model using computational fluid dynamics techniques. Jonko is an atmospheric scientist at Los Alamos National Laboratory who is studying interactions and feedbacks between wildfires and changing climate. She’s currently working with HIGRAD/FIRETEC on exploring effects of complex topography on fire behavior.